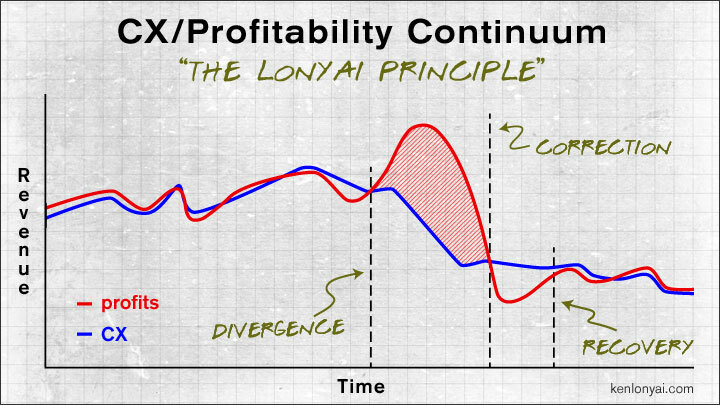 As the creator and evangelist of the CX/Profitability Continuum, a client was so smitten with its truths, that they “renamed” it “The Lonyai Principle.” That’s a great honor for me, so I humbly offer the alternative naming convention here. Profitability is driven by CX. There’s no magic to it. There’s no deviation from it. People purchase from and return to the places where they get the least aggravation and most happiness. So it’s a self-fulfilling cycle: happier customers lead to more profit. Intuitively, it can be argued, that understanding the market, good product design, strong management, proper cost control, intelligent pricing structure, effective sales/marketing, and efficient distribution determine profitability. They are underlying factors, but to the consumer (the one who exchanges money for a service or goods), the experience is what truly matters. From their perspective, the complex behind-the-scenes effort to get to their desired outcome is irrelevant. As the example graph illustrates (above), when CX rises or falls, net earnings principally keep pace. But so often, this critical connection is misunderstood or neglected. In some cases, it’s sabotaged in an attempt to cheat the CX/Profitability Continuum and achieve short-term gains. That does work, but the long-term boomerang effect is disastrous. I help commerce-focused companies like yours leverage the CX/profitability relationship by cultivating a profit producing user-centered approach throughout every aspect of business. A decision is made to increase short-side profits by means of one of the Dirty Deeds (see list). The impact point is where the “divergence” vector intersects the graph lines. The red shaded area between profit and CX illustrates the tension created by breaking the correlation – the danger zone. Profits rise, but they do so sacrificing customer happiness. Customers know what they want, realize what’s happening to them and in time, they migrate away (partially or fully) to providers that meet their needs. That trend is illustrated by the dive CX takes between the “divergence” and “correction” vectors. So, the danger zone can be understood as the inescapable force that causes profits to plunge en route to the point of correction if a correction occurs. The illustration is one of multiple scenarios. Many a shuttered company discovered the danger zone too late and couldn’t pull out of the dive. In fact, it’s not uncommon for a company to panic and pile on additional Dirty Deeds in a misguided attempt at damage control once their missteps are recognized. However, this graph illustrates a scenario where the company reverses and ultimately levels off from the slide. The turning point is where the “recovery” vector crosses the CX line. Nevertheless, there’s a severe penalty paid. Profit levels post “recovery” are typically far lower than pre “divergence.” Profits have tanked in comparison to where they were before the decision to break the essential CX/profit relationship. So long term, profits are worse off than before. And, the effort to get back to the level where things started is far more challenging and costly than to have originally focused on improving CX and organically pulling profits upwards in the process. Unfortunately, this is not an uncommon scenario. It has many potential triggers, most frequently the wrongful premise that if increased sales are difficult to obtain, cutbacks will yield the same net effect more readily. Another motivation comes from executives at the top of the corporate ladder and the desire of executives to look good and increase compensation while they are at the helm. With an average tenure of 89 months for CEO’s, 66 months for CFO’s, and 44 months for CMO’s, long-term viability and profits can get short-sided. When near-term thinking outweighs the future, it’s inevitable that the siren song of the Dirty Deeds becomes irresistible. If the scenario was reversed and a company forced CX upwards without regard for profitability, that company would not be long for this world. Pushing user experience to its limit without regard to the cost is unsustainable and the short track to failure too. I doubt that such a scenario has happened much in the course of business history, so, enough said. Finally, when I work with a company to increase profits by developing a comprehensive, long-tail CX strategy, my mandate is to prevent the existence of the danger zone, where profits ultimately ALWAYS plummet. Even so, if your company is already there and there’s still space under the curve, I can help. This can be done any number of ways, outsourcing/offshoring manufacturing, using inferior materials, lowering quality control standards, etc. Simply, sticking it to the consumer and raising prices based on a money grab or other justifications beyond any increased cost of doing business. Essentially giving less for the same price. Less functionality, or as happens with food products or CPG items, where the package size remains the same, but the weight or volume is stealthily reduced. An easy cost-cutting measure that can rapidly incense customers. Cutting back access to support, eliminating channels, understaffing, offshoring, poorly automated systems, etc. Claims and policies that are unsupported are a fast track to trouble. Examples include returns hassles, toothless warranties, exaggerated feature capabilities, poor durability, etc.